In the book Four Mothers at Chautauqua a certain pongee coat played an important role in the story. It was because of the pongee coat that Miss Hazel Harris met handsome Burnham Roberts. It was the pongee coat that made Burnham’s mother, Flossy Roberts, realize how much Hazel’s family neglected her. And it was gossip about Hazel wearing the pongee coat that set off a fearful argument between Hazel and her aunt. So what, exactly, is a pongee coat? And what was so special about that coat that everyone in the story seemed to notice it? 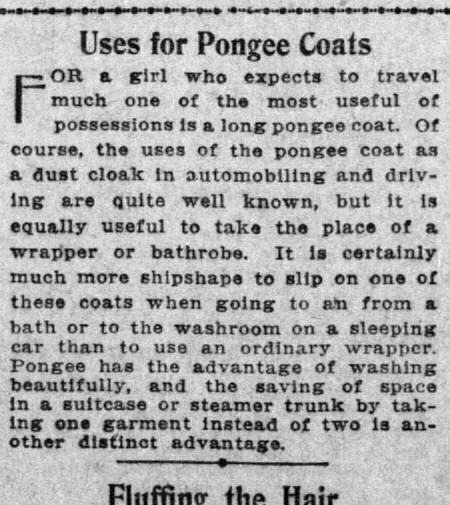 When the book was published in 1913, pongee coats were very popular, although not everyone could afford to own one. In those days women’s coats were made out of many different fabrics: serge and wool tweed were staples in cool weather; taffeta and linen in warmer months. But in summer, when days were warm and nights were only slightly cooler, ladies needed their coats to not only ward off potential chills, but to protect their gowns, skirts and blouses from soiling. So in summer, women’s coats had to be serviceable but light-weight and cool. Linen and taffeta were, for a long time, the fabrics of choice for summer coats; but about 1903 the fashionable world rediscovered pongee, a type of silk that originated in Shantung China over 3500 years ago. Pongee silk was a favorite for summer wear because it was cool, soft to the touch, long-wearing, and could be bought in varying weights. Pongee had one other advantage as a summer fabric . . . it was washable. Unlike taffeta and linen, pongee silk could go right into the laundry tub. 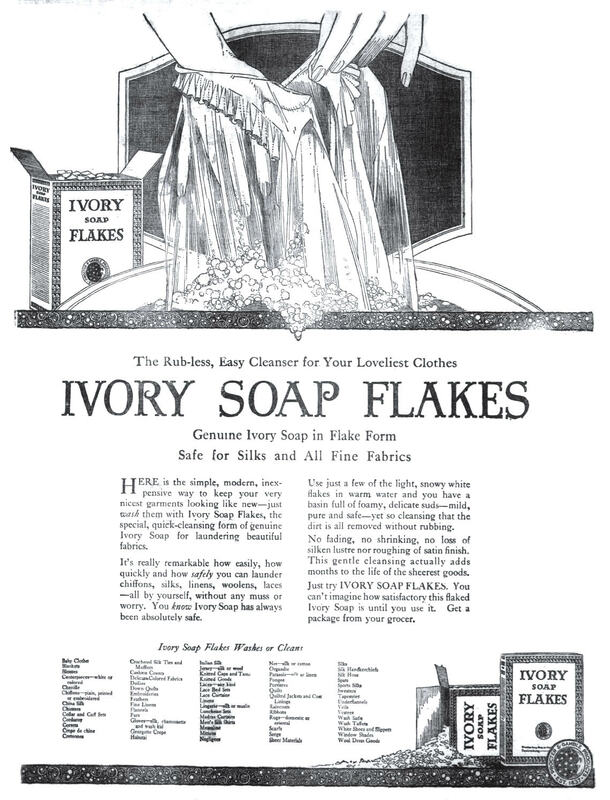 Ivory Soap Flakes included pongee in its list of washable fabrics in this 1920 ad. An expensive silk that could also be laundered was a fashion game-changer in the early 1900s. 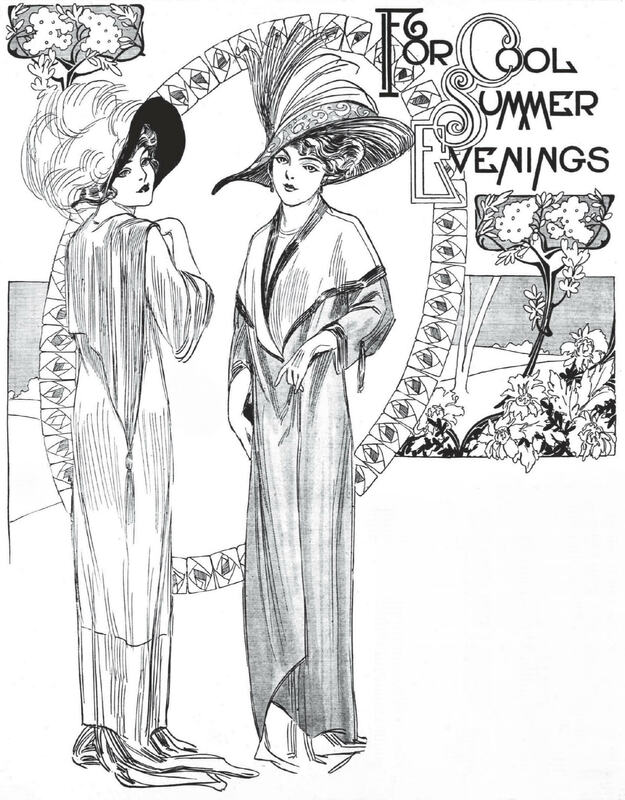 By 1905 dressmakers and garment manufacturers had integrated the fabric into their summer designs. 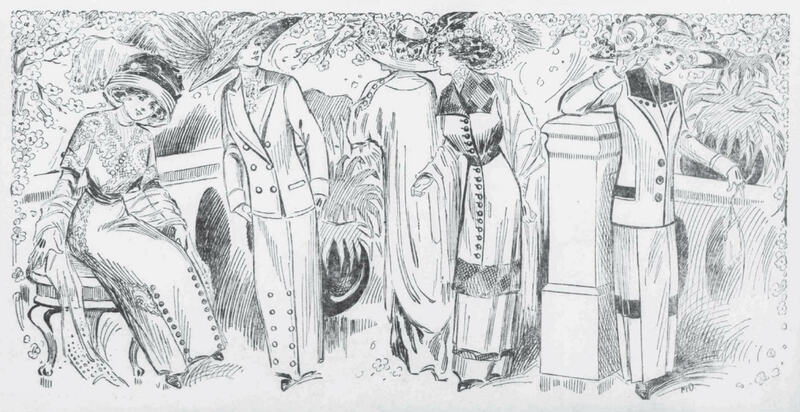 Click on this image to read the full fashion page from the March 20, 1910 edition of the Omaha Sunday Bee. Pongee’s natural color was a soft ecru, which was very much in vogue; but once a reliable method for dying pongee silk was developed, the fabric could be bought in every imaginable color. It was also available in varying weights, which meant it could be used in making everything from light-weight blouses and dresses, to parasols, belts and gloves. It was flexible enough to lend itself to tiny “pinch-tuck” details, and sturdy enough (in medium and heavier weights) to pleat nicely in skirts and tailored jackets. 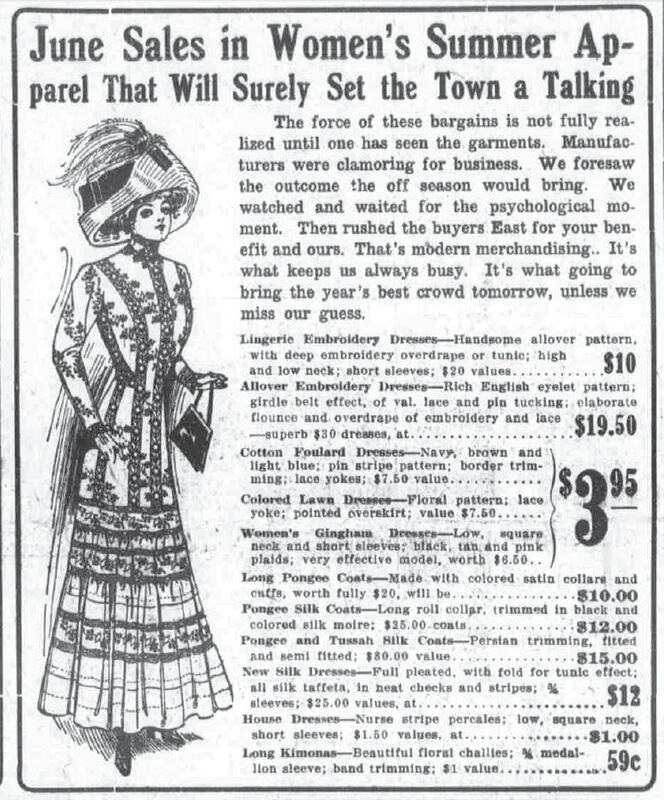 Click on the image to read the full fashion article about embroidered pongee shirtwaists in a 1911 edition of The Washington Herald. The fabric was even used to make hats. Pongee silk held shapes well; in lighter weights it was perfect for the layered scarf look so popular in driving hats. Click on the image to read the full-page article from a 1911 edition of The Washington Herald. Budget-minded consumers may have made do with shirtwaists and dresses made of gingham (which cost about 6 cents a yard) or cotton muslin (8 cents a yard). But if you wanted your summer clothes to be made of finer fabrics, you had to pay for it. Article from The San Francisco Call, August 29, 1909. Click on the image to see a larger version. Prices for pongee silk varied widely. American-made pongee in natural ecru ran about 70 to 80 cents a yard. By comparison, genuine heavy Chinese pongee suitable for making coats cost $2.00 or more per yard. Pongee was available in colors, but dyed pongee cost much more than the natural ecru color. Lighter weights of pongee silk also cost more, and they were highly desired because they were used to tailor gowns and shirtwaists. Click on the image to read the full fashion article from the May 26, 1907 edition of The Evening Star. That may explain why Flossy’s pongee coat was so eye-catching. Flossy lent her coat to Hazel Harris because Hazel had nothing to wear for a drive out in Flossy’s carriage. Flossy convinced Hazel to wear her long pongee coat so it would cover Hazel’s cheap and ragged clothes. “Her ‘lovely coat’!” repeated Josephine, dazed. And Flossy did get to know Hazel quite well; and since Four Mothers at Chautauqua had a very happy ending, it’s entirely possible that Hazel was one day able to own a pongee coat of her very own.